Y’all know, I love a good pun. And, I have a lot of puns for today’s post. 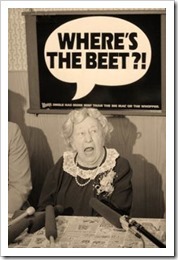 Beet: It’s what’s for dinner. 100% free range, grass-fed ground beet. I could keep going all day, but you get the idea! We were in Bend last week and met some friends at a new restaurant called Next Level Burger. I had high hopes for this new vegetarian restaurant in town. Bend is a pretty progressive place, and there are no shortage of restaurants where we can dine, but a burger place is definitely welcome! It was “good,” but not “great,” because while vegetarian (well, technically fully vegan), it was all really processed food. I was hoping for a good hand-made veggie patty, but, alas, it was pretty much a Garden Burger. And sadly, it was one of those places where the music was just WAY too loud, like most Chipotles, so it was hard to have a good conversation. So much potential…down the drain. For what it’s worth, our absolute favorite veggie burger is in Seattle at Blue Moon Burgers. They make a handmade black bean burger that is phenomenal. 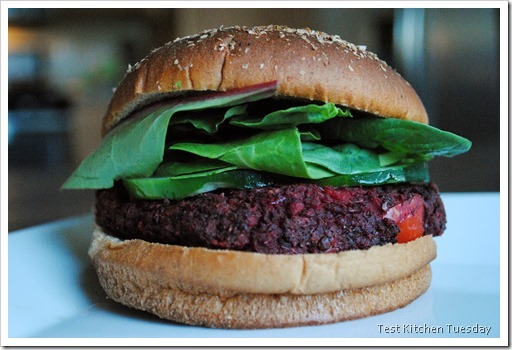 I can make interesting and whole-foods based plant burgers at home. There are so many varieties that there really is no end to the combinations you can create. One combo I haven’t done, though, is a beet burger. 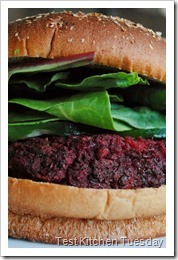 The first beet burger I had was at a restaurant called Plant Cafe in the Marina District of San Francisco. I didn’t realize it would be a beet burger per se – I just ordered a “plant burger” and when it came out, it was obviously beet-based. 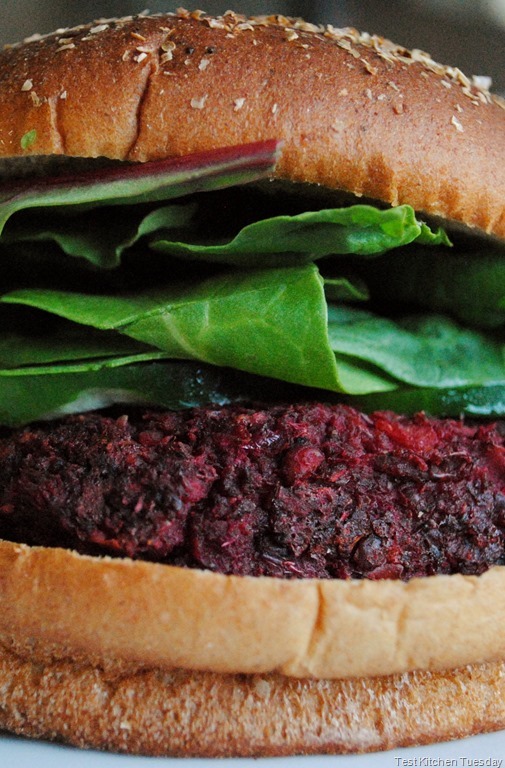 Beets make a really great veggie burger. You’re not going to convince a hard-core carnivore to put aside their ground beef for these, but, for open-minded eaters, they are very good. Even my finicky 2Chili likes these. Though, I have to dispel his reputation right now. Over the years, as I’ve put more and more – how shall we say? – non-mainstream meals in front of him, his tastes have really changed. I tell people all the time that once you start eating a whole foods diet, your tastes change. And, this is totally true. Junk food just isn’t as good anymore, and you don’t crave it at all. 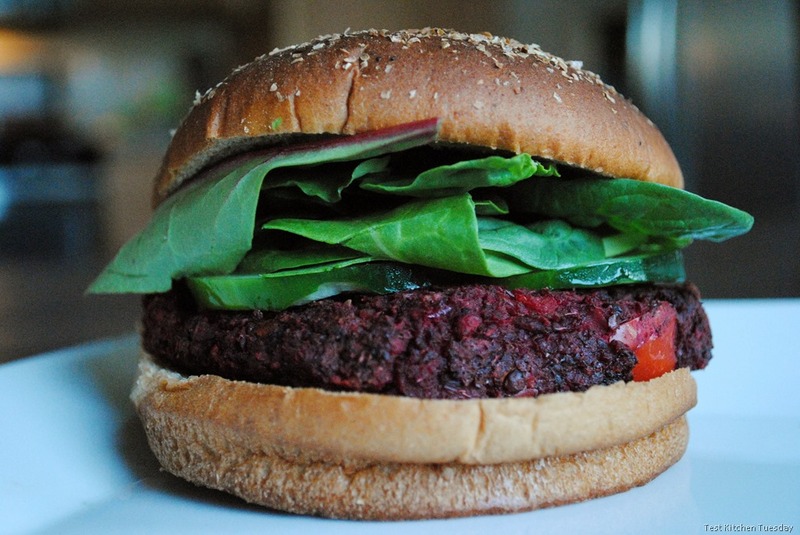 This works for anyone, including 2Chili, who gobbles this beet burger up with wild abandon. 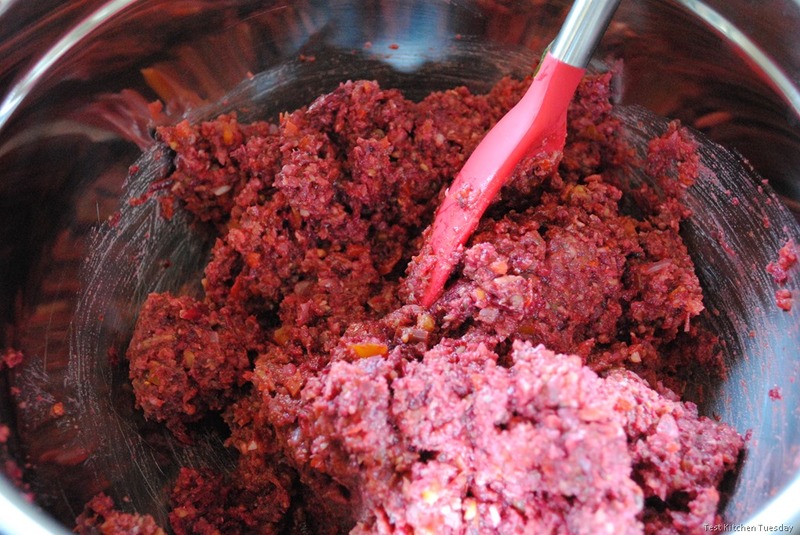 He ate a lot of beet burgers last week (as did I), as I worked on getting this recipe down for you guys. I waffled back and forth between using lentils and chickpeas, rice or breadcrumbs, an egg or an apple (yes, I was considering egg or apple for the binder). I settled on lentils, breadcrumbs and an egg, but I’ll give you a rice option below if you want to make this gluten free. 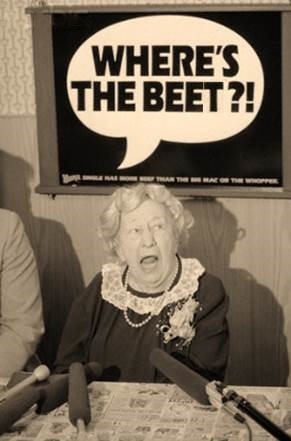 I will offer this warning, as I always do when working with beets: Beets stain. If you’re using stainable bowls, spoons, etc., use ones you don’t care about. And, wipe up your mess with paper towels, not your favorite dish towel. As much as I wish it were, this is not the type of burger you want to try to cook on the BBQ. 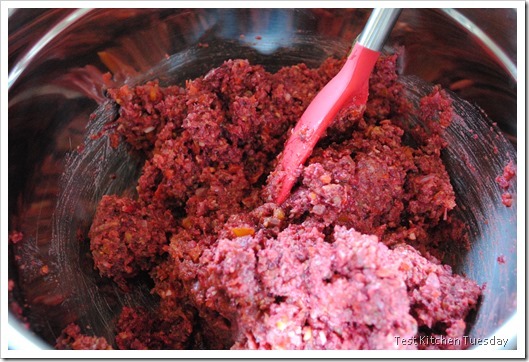 It will just crumble to pieces and make a big mess due to the water content in the beets. I don’t want you to have a big mess, so plan on either cooking on the stovetop or under the broiler (or how I do it: both). Okay, so let’s get down to it, shall we? Wait! Before we get down to it – can you believe that big patty only has 131 calories, but 8 grams of protein? It does. Including the bun, which has 200 calories, you’re into that burger for only 331 calories…Mind-blowing, huh? Note: Be careful when flipping and serving — these can be fragile; Once they’re on the bun, you’re good to go, but, exercise caution when moving them around! WOW! I just got a Ninja Chopper, was looking up recipes and found your site. Just wanted to say thank you for putting together such a great collection of recipes and knowledge! I read that you have discontinued adding new content but thought you deserved some props for what you did. Thanks again!